Not far from Atlanta is a theme park called Stone Mountain, at the base of a large mountain that has a massive carving the three Confederate leaders: Jefferson Davis, Robert E. Lee and Stonewall Jackson. When, on visiting, I mentioned to a friend my amazement that there would still be a celebratory tribute to people who fought for slavery, he responded that the Civil War was really about states' rights. I responded, "Yes, states' rights to allow slavery." This came to my mind when thinking about the drama surrounding a court case over a girls' school in Emanuel. Is there discrimination or not? The matter is more complex than might appear. While there are Sephardic girls in the Chasidic school and admission is based entirely without consideration of ethnicity, rules can be devised that implicitly and intentionally exclude students from a specific group. Is that the case? Here is a link to an English translation of the Supreme Court ruling: link (PDF). At the end of this post is a relevant quote. I don't claim to know with certainty whether or not there was discrimination. However, the student body makeup and the initial entry requirements imply that there was a conscious attempt to exclude Sephardim. We also have to keep in mind that there is widely acknowledged discrimination against Sephardim in yeshiva admissions. A friend of mine from YU recently changed all of his Sephardic practices to Ashkenazic to increase his son's chances of admission into a choice high school (his last name is ambiguous and his upbringing makes it easy to pretend to be Ashkenazic). There is discrimination against Sephardim, including the assumption that they are less intense in their religiosity. While many readers might agree with this assumption, the mere fact that you judge someone's religiosity based on his ethnicity is, by definition, racist. By what justification do you make assumptions about an individual based on the color of his skin or the place his grandparents once lived? Judge people on their own merits, not generalizations based on their ethnicity. This seems outrageous to me. The parents were not part of the lawsuit and, regardless, why did they lose the right to choose schools for their children? Even though the court acted in frustration, after multiple attempts to enforce their ruling, how does this justify violating the parents' rights? This is extremely heavy-handed. Here's the big question: What did this rally accomplish? Was it supposed to convince the Supreme Court to change its ruling? This sort of persuasion won't make them budge. To the opposite, it will cause them to become more entrenched. To encourage the legislature to change the law? There are other, more effective ways to introduce legislation. To show the general Israeli population that this is an important issue for Charedim? Maybe. To gather the troops and inform them that this is the issue of the day? Probably. What is the issue? If you ask a Charedi, he will tell you that it is parents' rights. Parents have the right to choose where to send their children to school and with whom their children will associate. In other words, like my friend at Stone Mountain, this is all a matter of rights. And likewise I respond that this is about the parents' right to discriminate. Parents want the right to say that most Sephardim are bad but the few good ones can go to school with my children. The claim that this is really an issue of parents' rights and not discrimination would be more convincing if R. Ovadia Yosef had attended the protest. He did not, nor did he encourage his followers to attend. Even if I am entirely wrong about this, let's take a look at what the public saw, both in Israel and around the world. 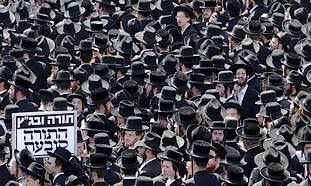 The international perception is that the one issue that energizes Charedim above all, that leads to the largest protest rally in Israel's history, is the right to discriminate against people with darker skin. Was the damage, the lessened perception of Torah and its keepers, worth the benefit? Did the little that came out of the rally justify the terrible denigration of Torah that it caused? At this point we need to declare to the world that the Torah leaves no room for this type of bigotry. If anything, this sort of discrimination violates fundamental concepts of the Torah, as explained at length in R. Joshua Berman's book Created Equal. We are all servants of God, equal in His eyes regardless of ethnic background. We must love each other as we love ourselves, and look past superficial differences to see the beauty in our common goals. Right now the world thinks that Orthodox Jews support ethnic discrimination. This discrimination is also clearly reflected in the regulations that were submitted for the approval of the director-general of the Ministry of Education, some of which were cited above. A study of the various regulations shows that we are not dealing with a track whose purpose is the study of the Hassidic way of life, but with an attempt to separate different sectors of the population on an ethnic basis, under the cloak of a cultural difference. The preference of students from a certain ethnic group in admissions to the Hassidic track, while placing bureaucratic difficulties in the path of parents of students from another ethnic group who want to register their daughters for the track, seriously undermines the right to equality. The same is true with regard to the school’s requirement that parents of the students should act in accordance with the lifestyle practised in the school, and the request — which was rightly excluded from the regulations — that the prayers should be recited solely in accordance with the Ashkenazi pronunciation. All of these merely serve an improper purpose, which is to exclude from the Hassidic track students from the Sephardic community, solely because of their origin. The characteristics of the discrimination in this case can also be seen in the atmosphere that has enveloped this case from the outset and that is discernible in the respondents’ conduct. In other words, the main discrimination in this case was discussed above, but it is also reflected in the fact that the Independent Education Centre and the school did everything that they could in order to satisfy the requirements of the Ministry of Education on an institutional level, but they did not really implement their solutions. In practice, their undertakings had little effect on the lifestyle in the school, and in this regard it has been said that: It should be remembered that discrimination always — and maybe today more than in the past — conceals itself and goes underground, but achieves its goals by using valid arguments.